To help class members see how the Nephites’ attitudes and actions in times of war can serve as a pattern for dealing with our earthly conflicts and the battle against Satan. Why Would Zerahemnah Not Swear an Oath to Moroni? How Did Democracy Help the Nephites Conquer Their Enemies? Morga Deane, "Introduction," in Bleached Bones and Wicked Serpents: Ancient Warfare in the Book of Mormon. Morgan Deane shows how text contains a strong and distinctive voice on military matters that should be taken seriously by modern readers and even policy makers and generals. He expands upon the Jaredite civil war, the face of battle, logistics, ethno-religious conflict, the political dimensions of conflict and insurgency, and strategy. Dallin Lewis, "Finding the Prince of Peace in the War Chapters: An Analysis of Alma 44," in Selections from the Religious Education Student Symposium 2007 (Provo, UT: Brigham Young Religious Studies Center, 2007), 121-129. This article studies the parallels in the attitudes and actions of the fearless Captain Moroni with those of the Savior Himself. This blog post outlines the wars of Captain Moroni in context of Book of Mormon geography and how his battle tactics were influenced by the lay of the land. Matthew L. Bowen, "The Scalp of Your Head: Polysemy in Alma 44:14–18," Interpreter: A Journal of Mormon Scripture 20 (2016): 39-45. 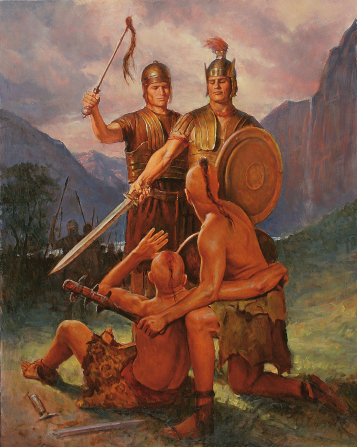 The fear that Moroni’s soldier’s speech (Alma 44:14) aroused in the Lamanite soldiers and the intensity of Zerahemnah’s subsequently redoubled anger are best explained by the polysemy (i.e., multiple meanings within a lexeme’s range of meaning) of a single word translated “chief” in Alma 44:14 and “heads” in Alma 44:18. Thomas R., Valleta "The Captain and the Covenant," in The Book of Mormon: Alma, The Testimony of the Word, Monte S. Nyman and Charles D. Tate, Jr., eds. (Provo, UT: Religious Studies Center, 1992), 223-248. This chapter explains how Mormon viewed Captain Moroni as an exemplary disciple of Christ. Captain Moroni's valor and focus on covenants ensured that his army would be faithful to God throughout the Nephite and Lamanite wars. Richard McClendon, "Captain Moroni's Wartime Strategies: An Application for the Spiritual Battles of Our Day," Religious Educator: Perspectives on the Restored Gospel 3, no. 3 (2002): 99-114. 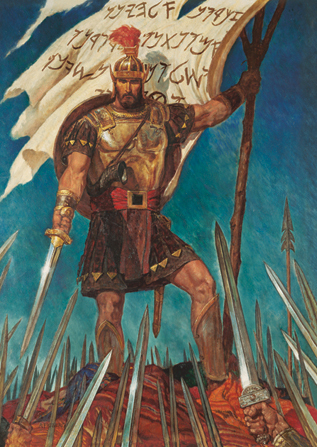 To draw parallels between the physical and the spiritual--between Moroni's physical battles on the field and the spiritual battles that we face in our own lives today, McClendon asks: (1) What strategies did Captain Moroni use to prepare and protect himself and his people from evil men such as Zerahemnah, Amalickiah, and Ammoron? And (2) How can these strategies be implemented to build spiritual defenses of our own against Satan and the evil of our day? Matthew Roper, "Moses, Captain Moroni, and the Amalekites," Insights 32, no. 4 (2012). In the Book of Mormon, the narrative in Alma 43–44 evokes the biblical story of the Amalekites. The shared elements, likely more than mere coincidence, make for an interesting comparison. Welch, John W. Welch, "Conference on Warfare in the Book of Mormon," in Reexploring the Book of Mormon, John W. Welch, ed. (Provo, UT: FARMS, 1992) 199-201. This article briefly summarizes the proceedings of the conference on warfare in the Book of Mormon. Each paragraph touches on the topic of a different speaker. Ryan Jenkins, "'Peaceable Followers of Christ' in Days of War and Contention," Religious Educator: Perspectives on the Restored Gospel 10, no. 3 (2010): 87-102. This article seeks to help educators teach students to recognize and develop the godlike attributes of exemplary individuals in the Book of Mormon, particularly when these characters are faced with war and contention, such as at the end of Alma. William Hamblin, "Book of Mormon, History of Warfare," in Encyclopedia of Mormonism, Daniel H. Ludlow, ed., Vol. 1. (New York: Macmillan, 1992). A detailed enclyclopedia entry that informs the reader on general warfare in the Book of Mormon, specific wars that happen, and the reasons for wars in the Book of Mormon. John L. Sorenson, "War and the Military," in Images of Ancient America: Visualizing Book of Mormon Life, (Provo, UT: FARMS, 1998), 124-133 . In this chapter from Images of Ancient America, Sorenson compares Mesoamerican warfare culture with the wars found in the Book of Mormon. Warfare was culturally embedded in Mesoamerican civilization more than even peace. Sorenson compares weapons, armor, and fortifications from the ancient Maya to compare them to the military tactics and provisions of the Nephites and Lamanites. The simile curse is a type of curse that appears in ancient Near Eastern, Old Testament, and Book of Mormon texts. In the Book of Mormon, simile curses appear in the context of treaties, religious covenants, and prophecies, and in several instances were acted out. Captain Moroni utilizes one of these simile curses when he creates the Title of Liberty. These curses were probably part of the oral tradition of ancient Near Eastern, Old Testament, and Book of Mormon peoples. Stephen D. Ricks and William J. Hamblin, eds., Warfare in the Book of Mormon (Salt Lake City and Provo, UT: Deseret Book and FARMS, 1990). This book published by the Maxwell institute covers a vast spectrum of topics on warfare in the Book of Mormon. Most of the wars in the Book of Mormon occur in what is often called the "war chapters" at the end of the book of Alma. This book contains contributing pieces ranging from weapons and armor to the spiritual application of military narratives. John L. Sorenson, “Digging in the Book of Mormon: Our Changing Understanding Ancient America and Its Scripture,” Ensign, September 1984. This Ensign article takes a faithful approach to synthesizing scholarly research on the Book of Mormon. Sorenson explains ethnographic and archaeological research that has been done on Mesoamerica, and concludes that the Book of Mormon can be situated very neatly in this cultural and historic setting. Taylor Halverson, “In Cover of Darkness and the Turning of the New Year,” Deseret News, January 1, 2015. Taylor Halverson teaches that even small details in the Book of Mormon can provide readers with valuable insight. For example, at the end of the book of Alma, Teancum slays Amalickiah at the New Year. While it seems like an unimportant detail, Halverson reveals it's potential significance. Daniel C. Peterson, “May Your New Year Begin Better Than Amalickiah’s,” Deseret News, December 29, 2011. Peterson explains the story of Teancum and Amalickiah also drawing on its particular timing of the New Year. While the New Year is generally a time of good fortune, the killing of the Lamanite king most certainly made for a bad omen. This article covers many Mayan festivals that coincide with events in the Book of Mormon narrative. It also discusses the special New Year's timing of the slaying of Amalickiah and the significance it would have had in Mesoamerican cultures. Matthew Roper, "Joseph's Coat and Moroni's Covenant of Liberty," Insights 22, no. 10 (2002). Roper compares the story of Joseph found in the book of Genesis with Moroni's crafting of the Title of Liberty. In both stories a garment is torn, and Moroni may be drawing on that story to signify the making of a covenant. Donald W. Parry, "Symbolic Action as Prophetic Curse," in Reexploring the Book of Mormon, John W. Welch, ed. (Provo, UT: FARMS, 1992), 206-208. This article describes various ways in the Book of Mormon that people evoke prophetic curses using symbolic actions. In the story of Captain Moroni and Zerahemnah, Moroni declares that Zerahemnah's scalp fell to the earth just as his army would fall to the earth if they did not surrender. Stephen D. Ricks, "'Holy War' in the Book of Mormon and the Ancient Near East," in Reexploring the Book of Mormon, John W. Welch, ed. (Provo, UT: FARMS, 1992), 202-205. In the Ancient Near East, war was closely associated with divine favor, and Israelite soldiers were expected to be ritually clean so as to be pleasing unto God. We find a similar pattern in the Book of Mormon, when Captain Moroni raises the title of liberty and encourages his men to fight for God. John A. Tvedtnes, "The Remnant of Joseph," Insights 20, no. 8 (2002). This article touches on the various uses of Joseph's remnant in the Book of Mormon, including the story of the Title of Liberty. Moroni alludes to the story of Joseph when he talks about how his garment was rent into pieces, just as Moroni rent his garment to create the Title of Liberty. Stephen D. Ricks and Robert F. Smith, "New Year's Celebrations," in Reexploring the Book of Mormon, John W. Welch, ed. (Provo, UT: FARMS, 1992). This article explains the Ancient Near Eastern significance New Year's Celebrations had, to illuminate the story of Teancum slaying Amalickiah on New Year's eve. John A. Tvedtnes, "Cities and Lands in the Book of Mormon," in Pressing Forward with the Book of Mormon: The FARMS Updates of the 1990s, John W. Welch and Melvin J. Thorne, eds. (Provo, UT: FARMS, 1999), 164-168. Alma 50 describes both the city and the land being called Nephihah. Tvedtnes explains this as reflecting the Biblical tradition of naming a general geographic area by that area's principal city.